It’s always interesting to view the Gulf through the prism of global events such as the Olympics. Much has been made of the ping-pong played by Saudi Arabia’s Olympic committee with the International Olympic Committee in respects to sending Saudi females athletes to the 2012 Olympics. A good overview of the affair can be read here in a piece by the Wall Street Journal’s Ellen Knickmeyer. The Saudi female athlete saga has been making headlines globally, both in print and via broadcast outlets. Al Jazeera covered the news extensively and featured clips of one of the two Saudi ladies. Sarah Attar is a 17-year-old, California-raised and -trained track competitor who will race in the 800-meters. Contrast this to Kuwait, which is sending its first female swimmer (yes, swimmer) to the Olympics. She’s interviewed here by the Kuwait Times. Faye Sultan is also featured in an interview below with the BBC (unfortunately this video can’t be embedded but can be accessed via the link below). She was also documented at a semi final Women’s 50m freestyle race at the Hungarian National Swimming Championship 2012 a couple of months back. The video is embedded below and you can make out Faye from her swimming cap which has the Kuwaiti flag emblazoned on it. And then there is Bahrain. According to Bahrain’s largest circulation English newspaper fourteen Bahrainis will be going for gold when they compete against the world’s best at the London Olympics later this month. 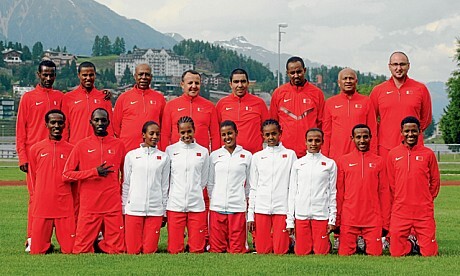 The article goes onto say that Bahrain’s medal hopefuls include Mahboob Hassan, Adam Ismail, Shawqi Jamal, Haleem Jabry, Bilal Ali, Mariam Jamal, Mimi Salim, Shama Mubarak, Taj Baba, Jamila Shami and Maitha Lahdan. Now we get to the fun part. If you’re a Bahraini or know Bahrain you’re probably going to know that those names aren’t your typical family names found in Muharraq, Manama or Riffa. Mahboob Hassan is a Kenyan who was naturalized in 2005/2006. Bilisuma Shugi is an Ethiopian, while Tareq Mubarak Taher is also a Kenyan who changed his name from Dennis Kipkurui Sang. Bahraini nationals often voice concerns about the number of naturalized Bahrainis in certain segments of government (the best example would be the police force which employs few native Bahrainis). And what has been the reaction of Bahrainis to the above? One person started a hashtag called #uniteafrica while the most popular tweet was the below. All in all, an interesting view into the culture of the Gulf through their Olympic policies. And no, I’m not even going to cover Qatar and their Brazilian/Uruguayan B football squad. This entry was posted in Uncategorized and tagged #uniteafrica, Ali Hasan Mahboob, Bahrain, Bilisuma Shugi, Faye Sultan, Gulf, Kuwait, Olympics, Olympics 2012, Saudi Arabia, Tareq Mubarak Taher by alexofarabia. Bookmark the permalink.